Chavanga Fish Blog: The main current. Chavanga hot season of salmon fishing. The main current. Chavanga hot season of salmon fishing. Mid-June. High season at Chavanga. Can be taken literally - it was hot season all over the Kola peninsula. Blue sky, the midnight sun over the horizon, very warm weather without rain led to a further decrease in the water level in the river. The water temperature in the evening was 20-22 degrees. In the morning it was cooler, water cooled to 18 degrees Celsius. The river has become comfortable for fishing. Many places became available among the waterfalls, which are usually only open for fishing in the middle of the season, in July. 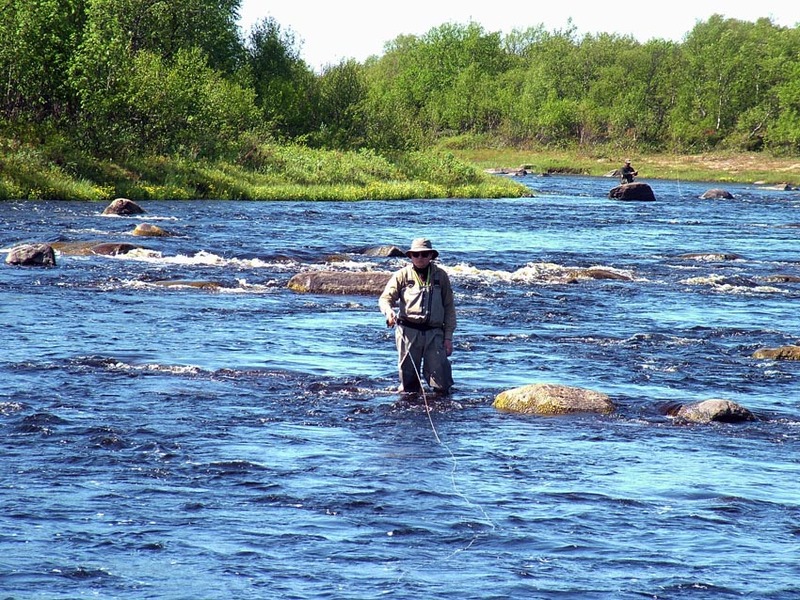 During the day you can easily choose comofortable spots for fishing any sides of the river. The river flows from the north to the south. Therefore, during the day different river parts covered by shadows in different ways. This makes salmon move from one position to another. You can use both banks to take an advantageous position of a shadow bank. I noticed that some anglers ignore the opportunity to use both banks for fishing. In my view, do not miss the opportunity to look at the other side of the river. This makes it possible to understand the river, see new places and find the right tactics for fishing salmon. I always try to pay attention to anglers looking for the best places to fish and the best position for the angler. You can take into account the position of the sun and to choose the right bank for fishing. With the right sun lighting, river will show you the best places - the tunnels and recesses on the bottom formed by the main stream, pits and mash stones in main current, suitable for salmon location. During the period of low water, the ability to navigate on the river and find the areas with the main current flow is the basis for all further fishing tactics. First cloudy day caused a sharp rise in activity and an increase in catches of salmon. At the same time larger salmon appeared, males that entered the river in autumn and early spring. Some fish had wounds which occured in the river after the winter. But it had little effect on their activity.